Macau has a wide range of ancient Chinese temples, spread right across the peninsula down through Taipa to the tip of Coloane. 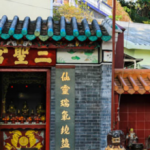 This list just shows the top temples you may want to consider visiting if you come to Macau. Unsurprisingly, given its rich maritime heritage, many of the temples are dedicated to safety at sea. The temples are primarily aimed at Buddhist, Taoist and Chinese Folklore faiths. 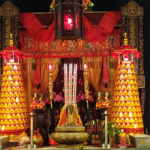 The main deities worshipped are Buddha, Tin Hau/A-Ma (Goddess of Seafarers), Kun Iam (Goddess of Mercy), and Na Tcha (God of War), although there are many others. The three largest and most impressive temples are the A-Ma Temple, A-Ma Cultural Village and Lin Fung Temple. Each of these is quite distinct and well worth a visit. 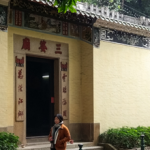 The A-Ma is probably the most popular, being on the main tourist trail, although the A-Ma Cultural Village on the top of a hill in Coloane is well worth the trip if you would like to see another side of Macau. The beautiful gold Kun Iam statue (大三巴牌坊) stands on a small island jutting into the Outer Harbour between Macau and Taipa, along Avenida Dr. Sun Yat-Sen.
Na Tcha Temple (Templo Na Tcha, 大三巴哪吒廟) was built in 1888, this is a Chinese folk religion temple dedicated to the worship of the deity Na Tcha. The temple is dedicated to Pak Tai (北帝廟, literally 'Northern Emperor') who is believed to have the divine power to withstand floods and fire. 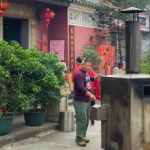 This Pau Kung Temple sits on the Rua da Figueira, a narrow, steep street that runs up to Kiang Wu Hospital from near St Antony's Church. Sam Kai Vui Kun Temple (三街會館) is located not too far from Senado Square,near St Dominic's Market (which used to be the old Chinese Bazaar area of the city). The small Sam Seng Kong Temple in Coloane was built in the late Qing Dynasty (Tongzhi 4th year - 1865).